Mayor Teresa Jacobs delivered her 2014 State of the County Address at the historic Ballroom at Church Street on June 6, 2014. 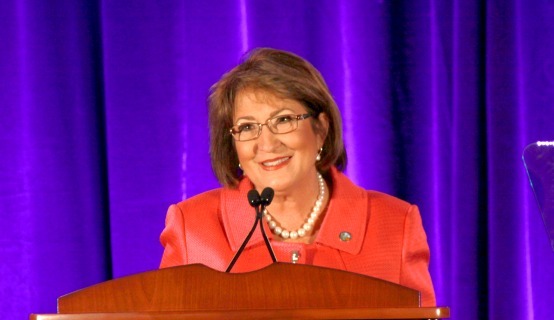 During her 30-minute speech, themed The Year of Transformation, Mayor Jacobs took citizens on a journey highlighting the outstanding achievements of the region and the many milestones the community has accomplished together making Orange County the best place in the world to live, learn, work, and raise a family. “The state of Orange County is strong and prosperous and continues to transform as we collectively excel and grow in a competitive global economy,” the Mayor told the audience of more than 600 citizens, community leaders, and special guests. Since Mayor Jacobs took office, construction is up 5 percent and unemployment is down from 11.3 percent, to 5.3 percent with 77,042 new jobs recently created. The region is also now a magnet for life science and high tech companies, as well as for tourist with 59 million visitors coming to the region in 2013 generating $187 million in tourist development taxes. Mayor Jacobs illustrated how the campaign, “Orlando, you don’t know the half of it,” will aggressively raise awareness and transform the way the world perceives the region. The growth and transformation of central Florida’s infrastructure and transportation was a key portion of the address, which showcased SunRail and the continuing work on an Osceola County and Lynx connection, as well as the All Aboard Florida project that may someday tie into a new multi-modal hub at Orlando International Airport. Mayor Jacobs’ vision for a new future for our children centered on the transformation seen in entertainment, sports and culture. The Dr. Phillips Center (DPC) will open by Thanksgiving, ushering in a new era of creativity. More than 70 attendees participated in a sneak peek of the venue during a walking tour of the construction site and DPC offices following the State of the County. The tour came just days after a ceremonial beam rising at the Citrus Bowl, which is currently at the mid-way point of its renovations. Mayor Jacobs also explained how central Florida is becoming a sports mecca with the new MLS soccer stadium coming to Orlando as well as the US Tennis Association headquarters planned for Lake Nona. The State of the County then turned to issues affecting those in need of care. Task forces like the ones focused on domestic violence and youth mental health issues are transforming how the community views the stigmas associated with the victims while finding solutions that include the implementation of effective strategies and care. Presenting the opening remarks and introducing the elected officials present was Central Florida Hotel & Lodging Association President and CEO Richard Maladecki. The event’s featured participants also included Orange County Fire Rescue, which gave the presentation of colors, while members of Boy Scout Troop 603 led the Pledge of Allegiance. The invocation was delivered by Pastor Carl Stephens, and Timber Creek High School students, who won the Mayor for the Day challenge, provided the official welcome and introduction of Mayor Jacobs. Perhaps the most notable participant was American Idol Finalist and Bishop Moore Catholic High School graduate Emily Piriz, who returned home from Hollywood recently and sang National Anthem. Major Jacobs also honored special guest Opal Shields, who has been an Orange County resident since 1916. Shields traveled by SunRail to the event with Commissioner Jennifer Thompson from Orange County’s Sand Lake Road Heart of Pine Castle Station. Of the many announcements during Major Jacobs’ address, she placed extra emphasis on the new uses of technology to better connect with the community. Unveiled during the event was Orange County’s new technological innovation — the OCFL News app and the new online Newsroom. Available now for free immediate download on Android and Apple mobile devices, OCFL News provides citizens with breaking news and information about their government. Mayor Jacobs also touted the success of the OCFL Alert and the OCFL 311 apps, which she and Chief Information Officer Rafael Mena recently presented to President Barack Obama during an invitation-only briefing at FEMA Headquarters on the use of technology during hurricanes and emergency situations. Both of these apps are also available for free download to Apple and Android devices. In an effort to expand the online conversation through the use of technology and facilitate a dialogue with a broader demographic, Mayor Jacobs invited key influencers to be Social Media Ambassadors during the event. The Ambassadors, who have large followings on social media networks like Twitter, Instagram and Facebook, engaged citizens in the social media conversation by sharing messages to increase public engagement and awareness regarding the “Year of Transformation.” Additionally, Google Glass was used to record and share live from the eyes of one of the Ambassadors, making the event the first State of the County address in Florida to feature Google Glass. For photos of State of the County and the Sneak Peek Walking Tour of the new Dr. Phillips Center for the Performing Arts, please visit Mayor Jacobs’ official Facebook and Flickr pages.